RARE BRITISH 1950S FILM LAMP. 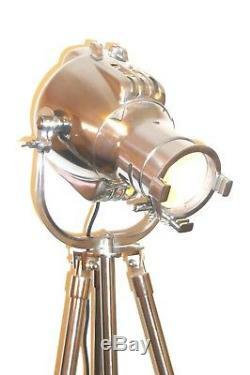 RARE TV STUDIO SPOT LIGHT - REPURPOSED INTO A DESIGNER HOME OR OFFICE FLOOR LIGHT. Originally designed in Covent Garden, London at the Strand headquarters in the 1950s. The light has been superbly engineered, and features a die cast ventilated body, Iconic design and an internal anodised reflector. The spot light has been professionally polished to a bright mirror finish by a specialist British company. The finish is to an extremely high standard. We take pride in the finished result as the light represents a unique and rare piece of design history. The Light gives a wide beam spread for feature / architectural lighting and showing specific objects such as a work of art. The Light is presented on a handcrafted highly polished metal tripod. The tripod features height adjustable legs with rich detailed fittings. The height range is adjustable from 75cm to 170cm and is ideal for all floor types. The light has been professionally re-wired with 3 core quality silk braded vintage style lighting flex and fitted with a high quality CE approved inline foot dimmer switch. The dimmer switch allows for the light to be turned on or off with the press of a button, or to change the brightness from a warm glow to bright spot light with the sliding control. The dimmer also features a night location neon indicator. The light has been converted for home or office use and takes regular household light bulbs up to 100 watts, we also had a deluxe vintage style Bakelite plug fitted (BS1363/A). This light has been fully pat tested by a certified tester for electrical safety and meets with the current British safety requirements. The light is a rare and original British Industrial design classic, passionately restored and looking for a new home. The light looks great in modern or period homes or for the finishing touch in an executive office. This is an iconic statement piece that will appreciate in value over time. Rare 1950's TV Studio Spot light. 3.5 Meter Black Vintage Silk Braded 3 Core Cable with Inner plastic shield. CE Approved High Quality Dimmer Foot Switch. Standard Filament Bulb (100 Watts). We are responsible for achieving good environmental practice and operating in a sustainable manner. We are committed to reducing our environmental impact and continually improving our environmental performance. We only use suppliers who do the same, as we have duty of care towards future generations. The new packaging we use for sending your light is sourced with environmentally based ethics and will be eco-friendly and recyclable. This Lamp has been carefully restored to a very high standard. The item "VINTAGE BBC TV STUDIO LIGHT ANTIQUE ART DECO INDUSTRIAL FLOOR LAMP STRAND 23 60S" is in sale since Thursday, May 15, 2014. This item is in the category "Antiques\Antique Furniture\Lamps\20th Century". The seller is "antcollworld" and is located in Walton-on-Thames, Surrey.